There are many ways to track a project, depending on your goals for a successful outcome. Leadership coach Susanne Madsen explains how asking the right questions can greatly improve how you track and manage your projects. Here’s a copy of the whiteboard for your reference! The project post mortem is a common practice in evaluating what went right and what went wrong after the completion of a project, but Susanne suggested that such a review can be support your project tracking throughout the entire project lifecycle. What or who stands in the way of us achieving our goal? What are our clients’ current frustrations? Can we improve our working practices… and How? How do we feel about the project at a gut level? What are we missing? What’s new and different? If we had skin in the game, our money on the line, what would we do differently? What can we learn and implement from other successful teams? By keeping these questions in mind throughout the various steps of your project you are providing a framework that will keep the project from spiraling out of control. Pro-Tip: One thing you should always do is try and see the big picture. It’s easy to get lost in the details when overseeing a project, but taking a “helicopter” view gives you the perspective needed to avoid flying into a cliff. Tool-Tip: To get that birds-eye or helicopter view, use real-time project dashboards. You can get an up-to-date view of what’s happening on your project so you can track your project quickly and easily. Hi, I’m Susanne Madsen. 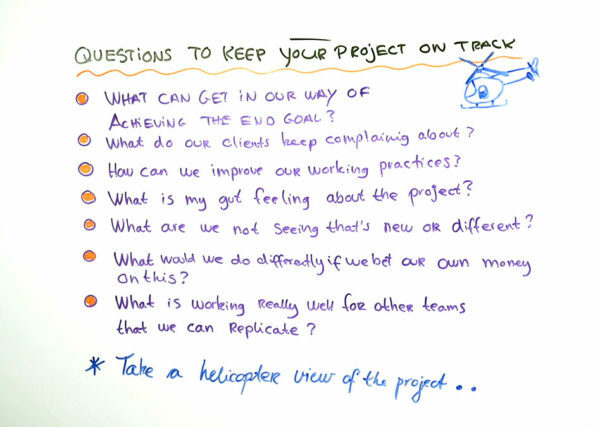 Welcome to this whiteboard session on Questions You Can Ask To Keep Your Project On Track. As you know, it is good project management practice to review your project at the end. What did we do really well and what lessons can we learn going forward? What didn’t work so well? But why wait until the end to review that? Really we must continuously review the project and take a helicopter view, meaning that you step back, you look down. What can we improve? What’s really going on here? I’ve drawn up a list of questions on the whiteboard, questions that will get you going. These questions you can ask of yourself, but also of the team. When you ask them of the team, you become a debate maker. You put a question out there and you see what happens. Be careful not to be too critical of your team. It’s important that you let them come forward with ideas. Let’s have a look at some of the questions. What can get in our way of achieving the end goal? What do our clients keep complaining about and what can we do about it? How can we improve our working practices? A very broad question that your team for sure will have a view on. What is my gut feeling about the project? You see, oftentimes we are very good at consulting facts and figures about something, but maybe not so good at looking inwards and consulting our own internal guiding system. What are we not seeing that is new or different? What would we do differently if we bet our own money on this? I love that question. You see, if we have skin in the game, we act differently. If you were a co-sponsor with your own private money, I’m sure you would have some ideas to how we could do the project differently.